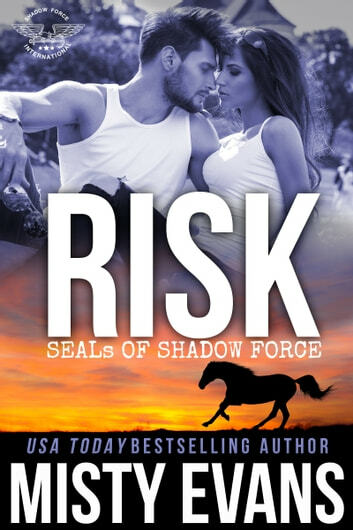 Second chance love, a prize horse, and a stalker all add up to exciting adventure and bittersweet love in this seventh book in the SEALs of Shadow Force series. Second chances, prize horses, & bad guys, oh yes! I’m a huge fan of second chance romances and love my romantic suspense, put them together and add them to the world of the SEALs of Shadow Force that Misty Evans has created, and I knew I would be in for another fabulous read. Noah is still a bit broken – from not only the torture he endured as a prisoner of an evil terrorist, but also the heartbreak he suffered when Jena walked away from him. He’s trying to heal, and with the help of his brother and his “family” at SFI, he’s starting to put the pieces of his life back together. When an assignment finds him face to face with Jena again I wasn’t sure how he would react – and once again Misty Evans did a superb job of showing Noah’s struggle with his emotions and feelings and weaving them into the story. Jena was what I would call an eternal optimist. She always sees the best in people and never wants to believe that anyone would want to cause her or those she loves any harm – and kudos to Evans for writing a character that might have ended up TSTL (too stupid to live) and transforming her into a strong heroine who never loses that belief that there is good out there. One of my favorite things about this series is getting to spend some time with Beatrice and the other characters of SFI – and being a huge Queen B fan, it was fun to watch her work behind the scenes to make things happen. Although the cast of characters is large in the SFI world, Evans always manages to bring in just the right amount of characters to offer support and add to the current story without adding any distractions. As usual, Evans builds a world that is engaging and entertaining, weaving characters and settings together to provide the backdrop to both the romance and the suspense. There are plenty of twists in the plot to keep things interesting, and I just loved the little bits that were woven into the story that gave some foreshadowing to what might be coming next. I’m a big fan of this series and Misty Evans – and would highly recommend this one! One thing I love about books is being taken away to a world that I know nothing about. In Risk by Misty Evans, we are whisked away to Tennessee to spend time with superstars, royalty, and a few villains. But, have no fear, because Rock Star Security sends Noah, one of the newest of the their bunch along with his older brother Asher (who lightens up every scene), to guard Silent Risk, a royal horse, and on yeah, Noah gets to face the woman he proposed marriage to many years ago. Fun times! I love Evans’ imagination when it comes to her plots. They are unique, fun, and rarely take you in the direction you would expect. She does a fabulous job of intricately weaving in several plot lines together and tying them all up at the end with this one. Risk gives us a taste of what it is like to have horses and service staff! The interesting characters Evans writes are so interesting that I want to meet them all! In Risk, I adored the way Jena saw the good in people and Noah was the opposite. Their romance was a sweet one to watch but I found myself “talking” to Noah often. He just needed a little extra help I thought. I am glad it turned out the way it did. They are a powerful couple. In addition to the adventurous story and lovable hero and heroine, I really liked seeing Beatrice handle everything she does so effortlessly. Asher brought humor to the story and I always like to see Zeb in action. He is great! I am looking forward seeing what comes of the little seeds Evans planted that elude to future stories with a new project headed up by the President. If you like romantic suspense stories, give Risk a read. It is sure to entertain you from beginning to end! Nothing Misty Evans and Adrienne Giordano write is ordinary. Warm, wonderful, hot and dangerous, yes; typical second chance romance? No way. This amazing team has once again created a world that pulls in the reader with a fantastic storyline and an unforgettable romance. Jenna is an actress, a country singer/songwriter, and a true country girl. There are few things that she really wants out of life. A chance to sing again, safety for her grandfather, and a chance to make things right with Noah. Noah is an ex-SEAL, you know what they say about that, and part of Rock Star Security. Babysitting a horse might not seem like the toughest job in town but for Noah, returning to the world in which he grew up is almost as painful as dealing with PTSD and the memory that his mess-up had terrible consequences. If Noah doesn’t steal your heart, no one can. Another winner by Misty Evan!. I was hooked right from the beginning. This was action packed with something going on at every turn. I enjoy trying to figure out who the bad guy is and I'm proud of myself because I suspected the person early on. Though the why was a great twist. Misty did another bang up job on the characters. I was so invested in their story and I always enjoy the previous characters making cameos. This has a second chance romance going on. I always like the couple get their shot at their meant to be HEA. I can't wait for the next book!